Archbishop of York Dr John Sentamu has called for the country to fight would-be suicide bombers with love. In his presidential address to the Church of England's ruling body, Dr Sentamu said it was not enough to rely on security services and laws alone. Instead the country needed to "out-imagine, out-plan and out-think" would-be bombers, he told the General Synod at York University. This could be done by building an "inclusive circle of love", he said. Dr Sentamu said neighbourhoods which were flourishing, safe, clean and generous needed to be created. He also said the grievances of would-be bombers needed to be tackled. He said: "Offering a vision of wholeness in a compelling and imaginative way that is so persuasive that would-be bombers would come to see this as their own vision. "A vision that would turn them from outsiders, self-excluding and deluded despisers of others, into belongers. "A vision which will help them to see that those they seek to destroy are their own brothers and sisters regardless of their religious affiliations. "The way to do this is by drawing a large enough circle of love which includes them and us." 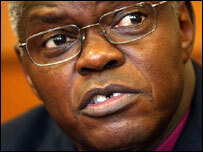 Dr Sentamu called for unity and said that revenge and the desire to banish would-be bombers "won't do it". He said: "Together we can out-imagine, out-plan and out-think would-be bombers and turn would-be enemies into friends by building an inclusive circle of love. "On our own we can't get it together. Together we can get it."